Well I must say the timing couldn't have been better. And neither could the hideous spectacle. There was Great Ridiculous Leader flogging his Economic Action vote-buying plan, like some cheap huckster on late-night TV. 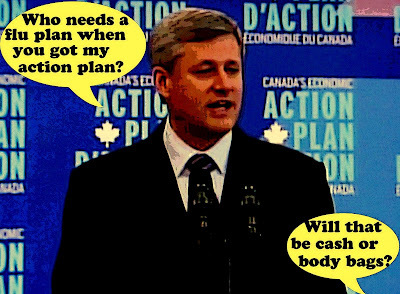 "Yabba dabba doo git ya Economic Action Plan !!! Double the dough if we don't have an election!!! " On the same day as this story was making headlines. Yikes. Can you believe that? They're more interested in buying votes than saving OUR lives? Harper doesn't care about us, it's all about HIM. And BTW don't these Cons have ANY Canadian values? Because let's face it, the only other place you can find a government website like this one. Is in a place like North Korea. And that's after they did a hasty little reno job.. The government of Canada website set up to promote the Conservative economic action plan had a slightly different look Monday: more than 30 photos of Prime Minister Stephen Harper had been removed. Ouch. That must REALLY hurt. I bet Great Shrinking Leader is furious. First he gets snubbed by Obama now this humiliation. Golly. If he gets any smaller they'll have to carry him around in a jam jar. Hmmm.... you know I think we can work with this one. Heh heh heh. Because killing Canada is one thing eh? P.S. I've been feeling pretty gloomy about an election recently. First we chew them up a bit.